Not great, I know, but better. 28 year old crayon and marker is really, really difficult to get off. And yes, I own and tried all those helpful solutions you are currently thinking of. I completed a huge milestone for myself this week. I ran two miles without stopping! My speed was 12 minutes a mile. Those of you who are runners are smirking right now, but I must remind you that the first time I ran a mile without stopping IN MY WHOLE LIFE was a mere three months ago. So this is a huge breakthrough for me. To say that I am not athletic is a huge understatement, but I am blessed with a patient exercise partner. Michael and I run in the evenings and I think it has saved our marriage (you know what I mean). And for all you shape watchers out there (hello Mom), no I have not lost any weight. In fact, I have gained some. But muscle weighs more than fat, am I right? So I have started following through more with Malcolm in hopes it'll improve his horrific behavior. And you know what? After only a week we are already seeing improvements. At first when he would disobey I would tell him he had to go to his bed and he would go there. Now I just have to ask him if he needs to go to his bed and he'll shake his head and the behavior will correct itself. Usually. So I'm thinking all high of myself because I feel like we are making real progress with him instead of just getting by and waiting for his to "grow out of it." And then one of my favorite bloggers posted about their personal struggle with a strong-willed child a little older than Malcolm. How perfect is that timing! Read the post over at Testosterhome. You love him right? Who doesn't love this little boy? Head over to Facebook to follow their journey to recovery and find out if you are able to help this precious family. Tomorrow we begin our Advent calendars. There was so much crying and fighting and whatnot over the chocolate ones last year (yes they each had their own but that didn't help), that I said they wouldn't get one this year. And I followed through. Only Malcolm gets a chocolate calendar. The other kids get Lego or Playmobil Advent calendars. Yeah, I really let them know who's boss around here. It's like the Quick Takes that never ends! 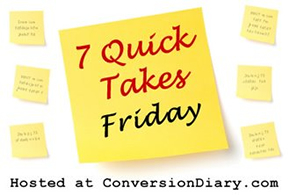 Head over to Conversion Diary to read more. Dayspring Christian Academy is a Christian school in Pennsylvania that educates children from Kindergarten to grade 12. What makes Dayspring unique from other Christian schools is that it employs the Principle Approach to Education. The Principle Approach is a historic, classical approach to education that is helping to equip young people to restore America to her gospel purpose. Principle Approach students are taught to think and reason from biblical principles and apply them to every area of life. Although Dayspring Academy is an on-sight school, they have designed some educational options for homeschoolers. They currently offer three self-paced on-line classes: How to Teach Literature Using the Principle Approach (intended for homeschooling parents), A.P. Statistics (for grades 10 to 12), and The Pilgrim Story. 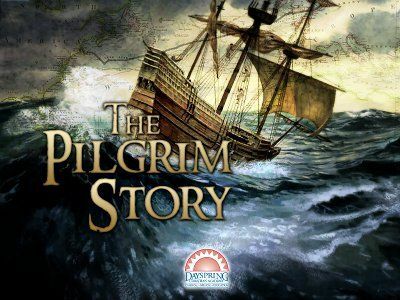 The Pilgrim Story is a self-paced interactive history course designed for grades 3 to 6. It focuses on the founding of America using Christian morals, character, and other Biblical principles. The course includes five units covering a total of 17 lessons. Included in the course are ideas for crafts, application, map-making and more. Each 30 to 45 minute lesson has students thinking and applying their learning to real life. Their work is recorded and managed in a notebook, an important element of Principle Approach Education. Additional notebook pages are available within the lessons. The instructor for this course is an experienced teacher at Dayspring Christian Academy, Mary Stauffer. Ms. Stauffer has led more than 20 guided tours of Plymouth, MA and uses the actual words of our forefathers to teach The Pilgrim Story. 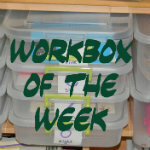 Since this product is designed to be used independently by the student, it is a perfect fit for my already over-crowded homeschool schedule. The course is self-paced and lasts anywhere from 30 to 45 minutes (enrichment activities require additional time). James can log in, obtain necessary paperwork, and complete the lessons entirely on his own. All that is required of me is to make sure there is a vacant computer and a reliable Internet connection. Having one child complete a subject independently is a wonderful bonus to our schedule, since I am often struggling to be able to homeschool four children at the same time. The Pilgrim Story course is available from the Dayspring Christian Academy Website for $99. It will be available for you within 48 of purchase, and your student will have access to the program for 6 months. In addition to The Pilgrim Story and the other self-paced courses mentioned above, Dayspring also offers homeschoolers a selection of live courses. Check the website for more information regarding the availability of the live courses. Other members of the Schoolhouse Review Crew also reviewed The Pilgrim Story. Click here to read their reviews or click on the banner below. Disclaimer: As a member of the Schoolhouse Review Crew, I received free access to The Pilgrim Story in exchange for an honest review on this blog. I received no other compensation. Since everyone is super busy with Thanksgiving stuff right now, I thought I would throw out a super easy workbox idea: Paint! You can buy a pack of washable paints for around $5.00 at the big box stores. Add some brushes and paper and you're ready to go! I don't even use special paper, just whatever paper we have on hand. You can have something ready for them to paint, or just let them paint their own thing. Work for the Teacher: Depending on your child, there could be a medium level of clean-up to a outrageous level of clean-up. I am blogging my way through the alphabet with Ben & Me. Come on over and join the fun! K is for Keyboard Kids which is what our piano teacher calls her group of students. Sunday November 18 was our first piano recital with the new teacher. The boys did great and it was so much fun to hear what all the students could play. There is no update on the dollhouse progress this week because there hasn't been any progress. I am trying to beat a terrible cold that seems to be going around. Not only does it make my voice sound like a frog's croak, but every unnecessary movement is exhausting. On top of that I was waiting for more paint to arrive. What kind of side dishes does your family enjoy on Thanksgiving? No one in this house likes the side dishes that I grew up with and love, and I am just curious about what people are eating with their turkey and stuffing. I am not a picky eater and enjoy all food on Thanksgiving, but sometimes I do miss the green bean casserole my Mama makes. They are draining the lake we hang out at during the summer and hike around during the rest of the year. As a result there are all sorts of "goodies" for the kids to collect. See that concrete block on the right of the photo. That is one of the swimming barriers in the deep end of the swimming section. Neat! The kids collected all sort of gross things that will probably sit on my porch for most of winter until I throw them out. When do folks decorate in your area? For some reason folks around here think that since Halloween is over we should get all set up for Christmas. I'm not complaining about all of it because I adore Christmas lights. But it is the other things like the giant blow-up gizmo's that I detest. Or the plastic lawn garbage that folks put out. My theory is that either people are really upset about the election and they are decorating to bring some cheer to their lives, or they are really happy about the election and they are celebrating by decking the halls. Speaking of Christmas, I would really like to give handmade gifts this year and since I can't make everything I am looking for ideas of inexpensive handmade items that I can purchase. And by inexpensive I mean at the most $20 and it would be great if they were really under $10. Okay, I need them to be in the ten and under catagory. And by purchase I mean things that I can get on etsy. So I have three different things that you can leave a comment about in these Quick Takes. Are you going to comment? If not... YOU'RE OUTTA HERE!!! I know only one person in the entire world will fully get that besides me, and I'm okay with that. Check out more QT's over at Conversion Diary. Especially when they send birthday flowers.